Our gorgeous Christmas tree skirts are the perfect backdrop for your Christmas gift-giving traditions. Convenient flip set-up and rolling stand makes display and storage effortless. No results were found for the criteria selected. Please change one or more of your selections. At Balsam Hill we offer a wide range of exquisitely detailed Christmas tree skirts, because no tree is complete without one! Regardless of the size, width, or style of your family’s Christmas tree there is something in our collection that will be perfect for you and your home. Our tree skirts are available in four different sizes including 90 cm, 120 cm, 150 cm, and 180 cm to suit any of our artificial Christmas trees. You can refer to our tree buying guide to help you find the perfect Balsam Hill tree for your home. We pride ourselves on the quality of our products; many of our items have been hand-beaded and hand-appliqued. 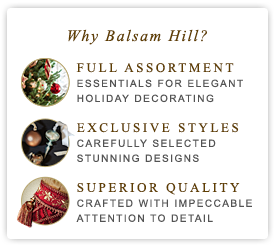 We also have many products that are exclusive to Balsam Hill. The deep colors of our tree skirts provide a lovely accent to the rich tones of your holiday presents and decorations. For those who prefer a more minimalistic look we offer simple red, green, silver, and gold skirts. Although simple, they are a great option if you enjoy decorating differently year to year as they are very versatile. Our beaded, embroidered, and silk skirts provide a more upscale feel, infusing a space with modern elegance, but also providing a timeless look. They will add bold detail to your décor and are a beautiful decoration themselves. Our Royal Garnet Tree Skirt is designed with red beads for an extra element of fun. For more holiday cheer check out our Mistletoe and Holly Tree Skirt, which brings even more joy to the holiday season with its classic holiday colours, hand-applied beads, and quality embroidery. We want to make sure that everyone can find a product they love, and with the large number of products we provide there is unlimited decorating potential. We are confident that our Balsam Hill Christmas tree skirts will be the perfect addition to your holiday decor! copyright © 2019 Balsam Hill ® All Rights Reserved. Your form has expired due to 30 minutes of inactivity. Under 180 cm Trees Best for tabletops or secondary spaces like kitchens or dens. 180 – 205 cm Trees Designed to fit homes with low to average ceiling heights. 210 – 230 cm Trees Our most popular size, designed to fit perfectly in rooms with average 244 - 274 cm ceilings. 240 – 265 cm Trees Perfect to showcase in homes with high ceilings for a grand display. We offer artificial trees in a wide variety of shapes, from traditional full-width trees to space-saving slim trees and flatbacks. When choosing your tree, we suggest that you consider the diameter (in the Shape description, this might be described as Full 100 cm) of the Christmas tree to help you choose the perfect tree for your space. This measurement is taken at the very widest point of the tree. If you plan to have a few branches touching a wall or a piece of furniture, the true space occupied by the tree will be about 15 cm less than the stated diameter. Regular (Full) Trees Our most popular choice because of their lush profiles and sturdy branches. Narrow/Slim Trees Perfect for an elegant effect in smaller rooms and apartments. Flatback Trees An elegant solution for small spaces, studios and small apartments. Potted Trees Beautifully accent all parts of your home including patios, entryways and porches. Balsam Hill's designers carefully craft our trees to mimic nature using site visits and cutting from live trees to guide them. We offer three types of foliage options that are made from either PE or PVC material. While some trees use one type of foliage exclusively, others may use mix of foliage types to achieve a particular look. The specific mix is specified on each product detail page in the section that describes the tree's foliage. True Needle™ Technology Balsam Hill's exclusive True Needle™ evergreen foliage is used to create our most realistic and luxurious artificial Christmas trees. This ultrarealistic foliage is created with injection-molded PE plastic and several different colors of pigment to mimic the structure, texture, and color of natural evergreen needles. A unique feature of True Needle™ foliage is the color variations within the branches. For example, the branch might be a brown/green while the needles start off a dark green and slowly fade to a lighter green. Classic Needles Balsam Hill's Classic Needle foliage has soft, flat and flexible needles with a more classic artificial look. These needles are made from thin sheets of PVC that are cut into fine strands to resemble evergreen needles. We use these resilient, flexible needles as the primary foliage of many of the trees in our very affordable Traditional trees. It is also used as filler for most of our Realistic and Most Realistic Christmas trees because of its superior ability to block light and create a "full" look for the tree. Pine Needles The PVC pine needles used by Balsam Hill® are specially designed to mimic the size and texture of long, thin needles of a pine tree. These needles even have the rigid texture of real pine needles. If you roll them between your thumb and finger, you will feel the ridges. If you long for the beautiful glow of lights on your tree but dread untangling the wires, Balsam Hill's pre-lit Christmas trees are the answer. All of our lights are UL® approved and professionaly strung on the tree by hand to minimize the appearance of wires. Each of our pre-lit trees for indoor use come with premium commercial grade lights so that if one bulb burns out or is removed, the rest stay lit. We have a wide variety of pre-lit lighting options to suit every decorating need. Candlelight™ led lights Enjoy our premium energy-saving LED lights that never burn out. Unlike cold light emitted from traditional LEDs, our energy-efficient Candlelight LEDs provide a warm glow reminiscent of a candle's flame. Multicoloured led lights Enjoy a Christmas glow from our premium energy-saving multicoloured LED lights that never burn out. Unlit Trees Use your own special lights on these unlit trees. For unlit trees that specify Simple String™, we have already pre-strung the trunk with extension cords, allowing you to plug your choice of lights into extension cord outlets throughout the center of the tree.